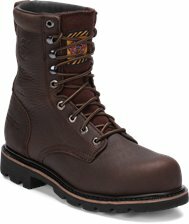 The 8-inch tall Pipefitter Tobacco Brown Waterproof Steel Toe lace-up workboot reliable on the job. 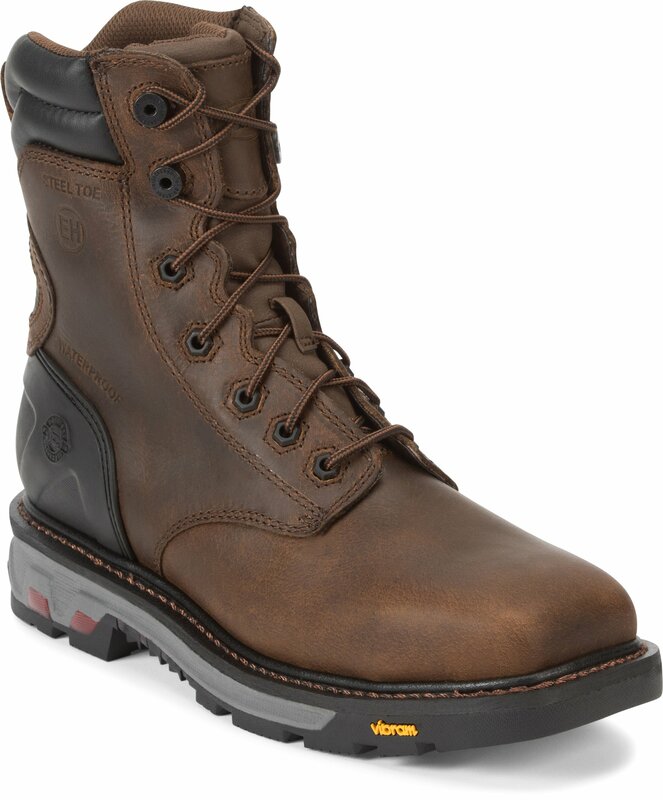 Its waterproof dark brown leather exterior supports an Ortholite® insole for a cushioned fit, the Vibram® Commander-X5™ rubber outsole that's resistant to heat, chemicals, oil, gas, slipping, marking, and a steel shank for added reinforcement. 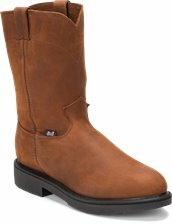 The steel toe provides protection and waterproof leather keeps your feet warm and dry no matter the working conditions. This boot is electrical hazard rated and meets ASTM F2413-11, 175, C75 EH safety footwear standards. These are the best work boots I've ever used. They are by far the most comfortable and longest lasting that I have found. I work in the oil patch in West Texas and I'm on my feet for the majority of the day. My feet have yet to get sore and they stay dry during the occasional rain that we do get. These will be the ones I buy again and for as long as Justin makes them. I knew Justin made western boots, had no idea they even made a lace up work boot, and was only introduced to them when shopping at a western wear store. New shoes and boots are usually stiff etc and while a fit maybe good, everyone expects that transitional period of break in. I was very surprised how good this boot felt right off the shelf, they have loosened up some but the fit and comfort have remained good from the get go. I use my boots working at a airport and am walking pavement all day, the soles have great shock absorbing qualities and the entire boot is very supportive, nothing wimpy here and yet a very good looking boot, I am no used to paying this much for a pair of footwear but as I have found seem to be well worth the money, double thumbs on these boots.